I am now one month into my Cambridge MBA experience but it feels like so much longer (in a good way!). Every day is so full of information, networking, practical sessions and fun that I’m already starting to feel like a member of this society, like I truly belong here. There’s been a lot happening in the past month, for one, I’m officially a University of Cambridge student! You might be thinking, Akosua, what are you talking about – you just said you’ve been at the Judge for a month. Well yes, that’s true, but at Cambridge, you’re not officially a student until you’ve matriculated into your College, and at mine – Downing – we did just that on October 14th. 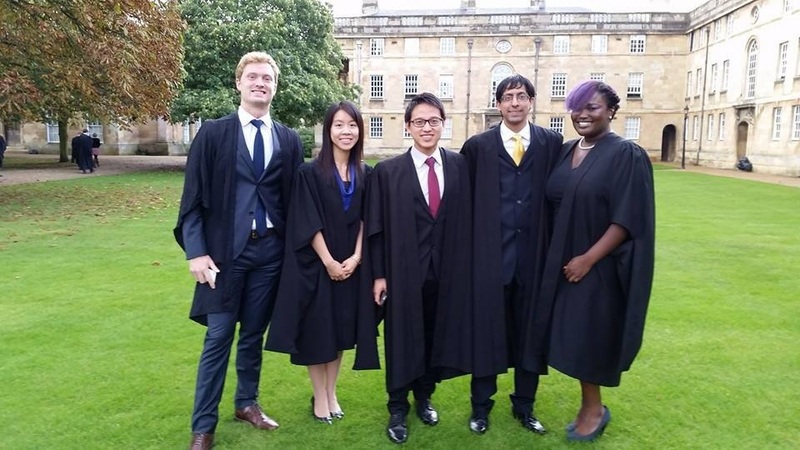 After having our official photo taken in the morning we attended the matriculation ceremony later that evening, before heading to our first formal as official post-graduates of Downing College. The meal was excellent; Downing is notorious for really good food and this was no exception. The day after Matriculation was another big one: we met our Cambridge Venture Project clients for the first time! One thing that really distinguishes the Cambridge MBA from other programs is the immense amount of practical application we receive through our projects. Part of the reason the classes have to move so fast is because our CVPs begin about a month into the program – and we’re actually applying what we’ve already learnt. I’m not sure how much I can disclose about my client, so I’ll just say they are a start-up in the film industry and this project is right up my alley. The executive team is energetic, passionate and really happy to be working with us. And I feel the same way – it’s wonderful to know that the work I’ll be doing over the next 6.5 weeks with my team is going to help someone in a very real way. In between all of this and classes, we’ve also started forming our Student Interest Groups (SIGs) and voting in our next Cambridge Business School Club (CBSC) officials. I haven’t gone for leading any SIGs, but I did run in the CBSC elections, which was a lot of fun and a good way to get involved without overwhelming myself. I’m excited to see what ideas and plans the new board has for our class! I have been trying to get more involved in some things outside of the MBA to maintain some balance. I joined CUTAZZ, a dance collective at Cambridge that provides classes in all types of styles and hosts a couple showcases. I’ve also become really involved in an amazing opportunity called Silicon Valley Comes to the UK (SVC2UK). It’s a 3-day conference split between London and Cambridge that connects entrepreneurs and provides an opportunity to learn about some big ideas, while giving participants invaluable information on starting their own businesses. I’m already working on marketing and promoting SVC2UK, which is proving to be very exciting. I definitely encourage you to attend this free event from Nov 19-21st should you happen to be in Cambridge. If you see me in the fray, please say hi! Akosua Ayim is an MBA student, poet and former client service representative in Forex Prime Brokerage from Harlem, NY by way of New Jersey. She loves blogging, playing the guitar (still learning!) and working with Be Gr8, a non-profit she helped create in New York City.